The Shane Poe chimney top improvement project. Original damper was gone, replaced by the sheet of metal in the next photo. Note the debris in the bottom of the chimney in the following photo. Photo of flat plate of steel with 8" hole in middle removed from the top of the fire box, an improvised fireplace damper to accomodate an fireplace insert. Top sealing fireplace dampers prevent bugs, birds, and small zombies from entering chimney and home. Santa has pass code. All Season Chimney Top Sealing Fireplace damper. Wide open to allow chimney inspection or cleaning. Can be easily removed for cleaning as well. 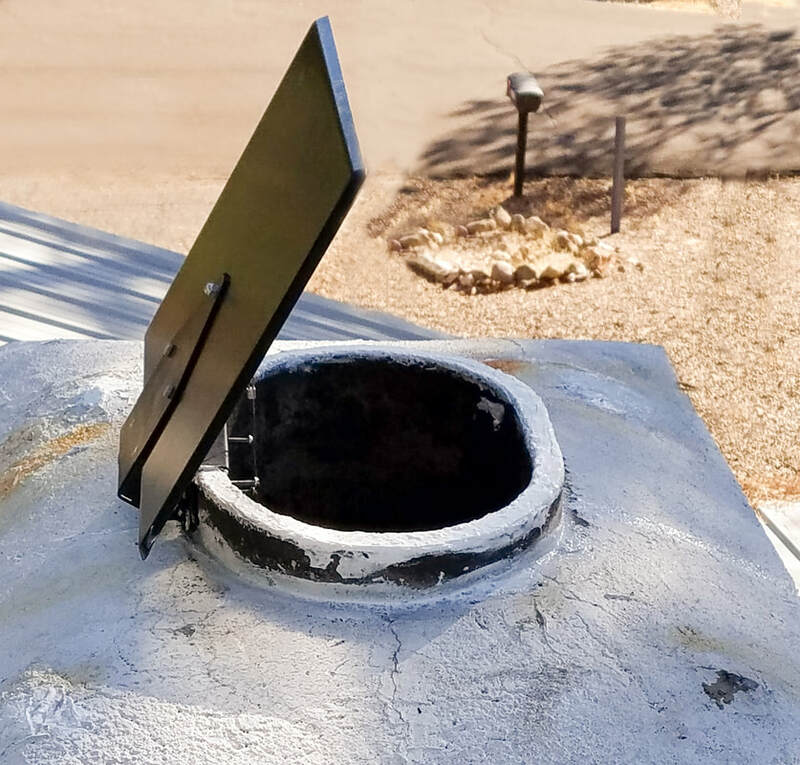 Chimney top flue cover saves energy, prolongs chimney life, keeps out animals and insects. Detail of top mounted fireplace damper on chimney flue tile. All Season Chimney Top Fireplace Damper open at the position for the optimum efficiency of the fireplace chimney draft. This photo depicts the control cable chain link for the top mounted fireplace damper in the optimum draft position. One link caused smoke in the house, three links would allow excess energy to escape. Two links open was the perfect chimney draft. I am a very handy guy, so the installation was a breeze for me. Considering the mod that had to be made installation was less than 1 hour total split between 2 days (allowed silicone to completely dry). Yes, the mod was unexpected. I don't think you should be responsible for mods because every project will be different and if it wasn't right you'd be liable. The top of the flu isn't perfectly flat/level, I added enough silicone to make as flat a seal as I could (it's pretty close to air tight). I am happy with the look of the ASCC. One thing I would add to your directions is to consider the wind direction for placement. Yes there was pine needles at the bottom of the flu. I didn't notice any evidence of critters. I found that some moron cut the original damper handle off then welded it open. They also added a flat plate of steel with 8" hole in middle to the top of the fire box. I'm guessing it either had an insert or they made a retro damper witjnthe 8" hole. I'll send a pic of the closed ASCC and the flat steel for clarification. I found that when i installed it the mounting bracket wanted to tilt the ASCC backward causing about a 1" hap when closed. I was able to add a piece of steel the outer hinge bracket to tip it forward for a tighter seal. In regard to a fire with link adjustments, I have already experimented with this. I found that 2 links away from closed is optimal. 1 link from closed makes the house smell of smoke.